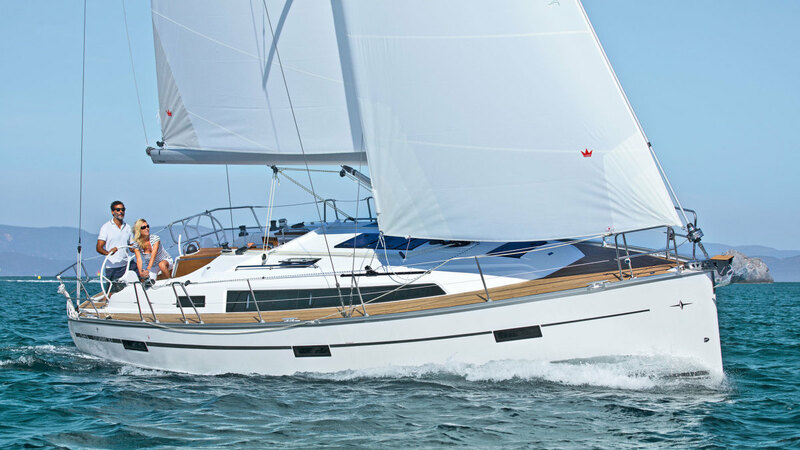 Bavaria’s Cruiser 36 received mixed reviews when it was launched a few years back—not because of its sailing abilities, but because of its love-it-or-hate-it styling. Those pillbox-themed portlights and the concave curve to the cabintop sides were not stylists BMW Group Designworks’s most inspired treatments, although that didn’t prevent more than 350 examples from being built. 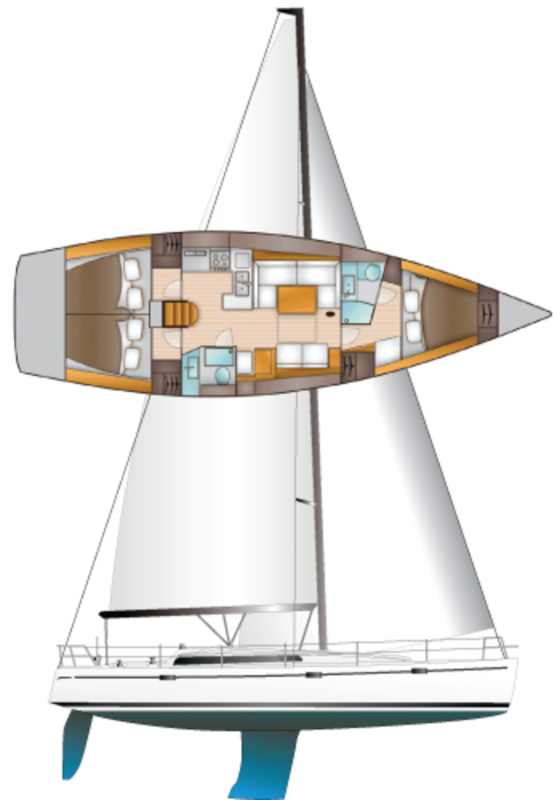 The sweet sailing characteristics of the Farr-designed hull live on in the 36’s successor, the Cruiser 37, which enters this hotly contested market segment with a revamped deck and cockpit layout and a brand new interior. It also happens to be a rather good-looking boat. Bavaria Yachts’s engineering is refined to the nth degree. Hulls are laid up by hand, with fiberglass skins sandwiching Airex foam, reverting to a solid fiberglass laminate below the waterline and in way of any through-hull fittings. The deck is also foam-cored, with aluminum plates providing extra strength where deck gear is mounted. Holes for fasteners, hatches and other openings are cut by a CNC robot to ensure exact tolerances. [A structural pan is laminated into the hull to stiffen the boat and spread keel and rig loads, and the main structural bulkhead is laminated in place. There’s also a collision bulkhead in the bow. Cast iron ballast is carried low in a flattened bulb in both the deep and shoal-draft keel options. 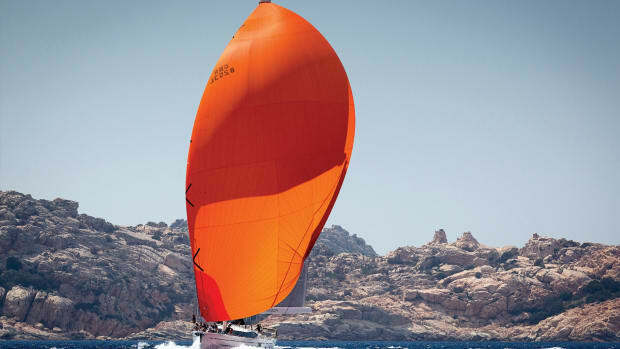 The Seldén 9/10ths fractional rig comes standard with in-mast furling, and is deck-stepped with swept-back spreaders. The cap and lower shrouds are taken to chainplates at the gunwales. Sheet tracks set on the cabintop and chainplates at the deck edge make for remarkably uncluttered decks, though you have to duck inside the lower shrouds when going forward. I’d have liked to see longer grabrails on the cabintop, but Bavaria is no worse an offender here than any other builder. The anchor locker houses an electric windlass serving the single bow roller. The fixed cockpit table provides a welcome bracing point for the crew in the wide, comfortable cockpit. It also houses the compass and plotter. 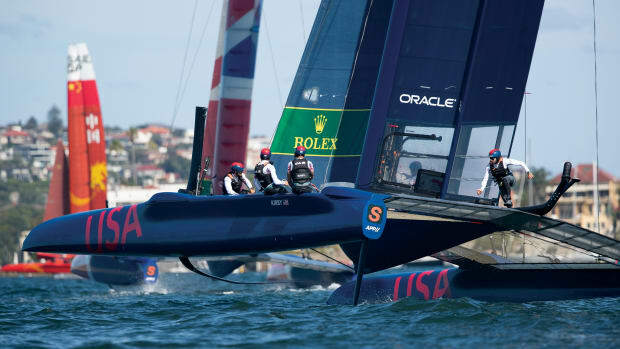 Such an arrangement works well in a boat with no pretensions to racing. The seats are not long enough to sleep on, but you could stretch out on the cockpit sole easily enough. Where the 36 had a single wheel, the 37 has a more modern twin-wheel setup, which provides excellent access to the drop-down swim platform that is such an attractive feature of modern cruising boats. There is plenty of room for the helmsman to sit behind or to either side of the wheels. On the three-cabin version, the cockpit lockers are shallow, but long and wide enough to hold fenders, warp, kedge anchor and dinghy pump. 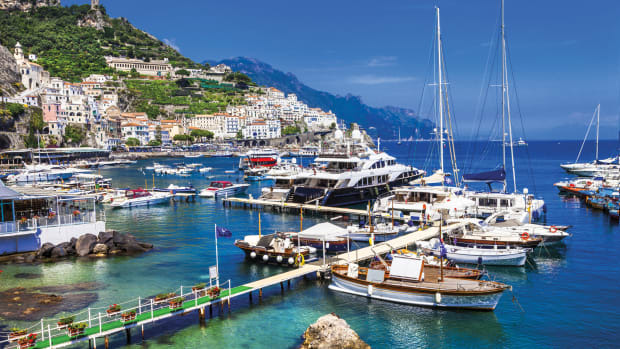 The two-cabin version gets you a cavernous locker to port that could take a dinghy and outboard, and would be the best choice for those interested in cruising extensively. With the new deck layout came a new interior layout. The transition to twin wheels also meant bulkheads had to be moved forward, opening up the saloon. There is nothing unusual about the layout—indeed, it is comfortingly familiar, with its opposing settees, centerline table and L-shaped galley—but it is well executed and the living areas felt warm and inviting, trimmed in mahogany veneers (teak and oak are options). Light and air stream in through a half-dozen opening hatches and nearly as many opening portlights, as well as hull ports in the saloon and forecabin. 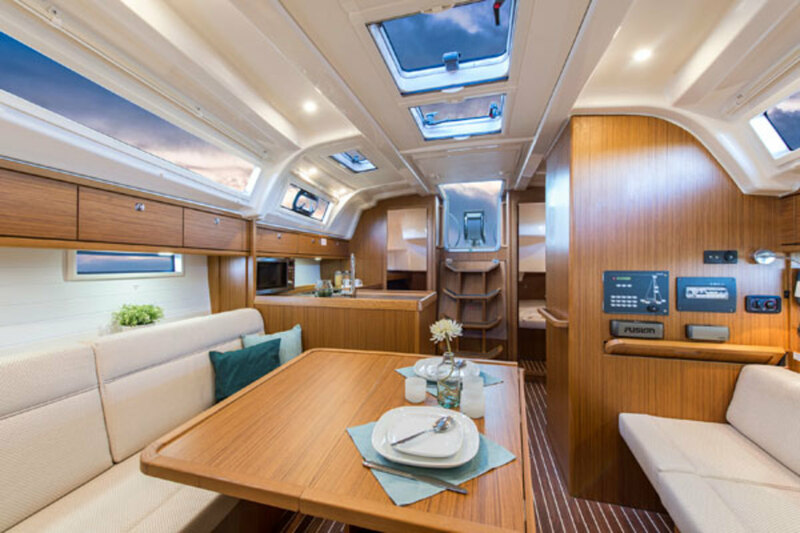 The master cabin forward has good stowage in a pair of mirror-image lockers with shelves and space to hang clothes, as well as some room under the long, wide berth. In the three-cabin layout, the twin aft cabins are habitable enough and have plenty of stowage for short cruises. The two-cabin version has a larger head compartment with separate shower and boasts a dedicated nav table, which is lacking in the three-cabin version. The berth itself is also bigger in the single aft cabin. 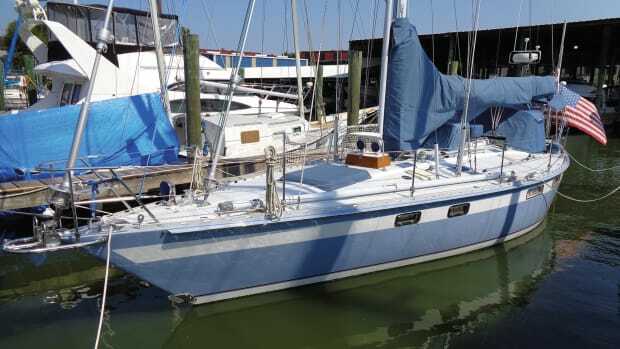 Since both settees are long enough to sleep on, I suspect most buyers outside of the charter market would go for the two-cabin layout unless they intend to pack the boat with guests every weekend. Sea cooks will find the galley well laid out, with decent stowage, a deep double sink, two-burner stove and a well-insulated refrigerator. Interior lighting is LED, and handholds are in good supply. The 6ft 5in headroom will please all but pro basketball players. You don’t expect a Farr-designed boat to sail poorly, and I found the 37 lived up to its pedigree. Sailing the deep-keel version in a steady 10 knots of wind on Long Island sound, we made an unstressed 6.5 knots at 35 degrees to the apparent wind and tacked through less than 90 degrees. Coming off the wind to a close reach, we exceeded 7 knots. The small jib is easy to handle, and if you time your tacks you can sheet it in without a winch. 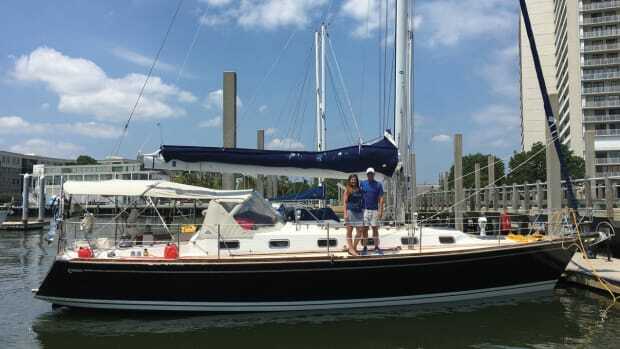 The Jefa steering gave excellent feedback, and we enjoyed the boat’s light and positive feel.  The trend on cruising boats today is to do away with a mainsheet traveller in favor of a double-ended bridle-style mainsheet taken to blocks on either side of the companionway. However, while this is a commendably simple arrangement, aboard the Bavaria 37 it means you have to crank on the boomvang to keep the boom from lifting when the sheet is eased, instead of just easing the main down the traveler in the gusts. 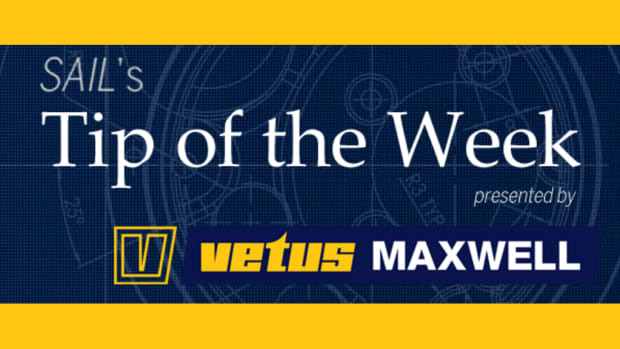 It also means the helmsman can’t reach the mainsheet without going forward. A better alternative would be the 37’s optional German mainsheet system, with the sheet tails taken to the secondary winches by the helms so that the helmsman can control both sails. Our test boat had the minimum of cruising equipment on board and would probably not be as sprightly with a full payload. Nevertheless, I’m sure she will not disappoint sailors in search of some satisfying performance to go along with the cruising comforts. 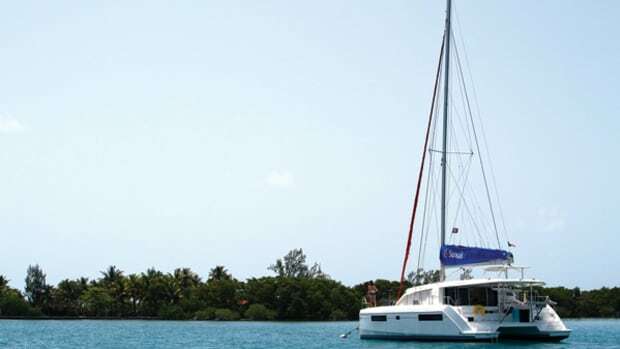 The optional full-battened mainsail would give her even more pep. The 28hp Volvo-Penta saildrive swinging a two-blade fixed prop drove the boat at an easy 6 knots, close to 8 knots when we opened it up. Sound levels in the saloon and on deck were acceptable. Handling under power is vice-free. Systems installations were nicely done, as they should be by a builder with as many boats behind it as Bavaria. Shore power, battery charger, a nice Fusion sound system and Garmin sailing instruments are all standard.